Royal Academy of Engineering post-doctoral fellow in the Department of Library & Information Science, Dr David Haynes launched the second edition of his book,Metadata for information management and retrieval (Facet Publishing) with his thoughts on the topic of ‘Metadata – the political dimension’. 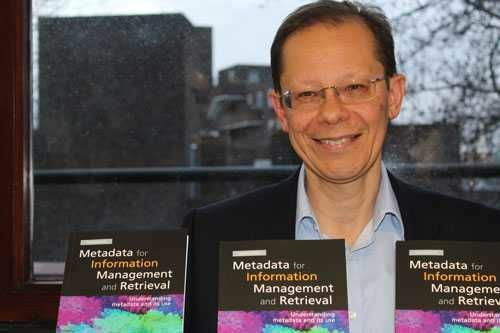 On 4th April 2018, Research Fellow Dr David Haynes, formally launched the second edition of his book, Metadata for information management and retrieval (Facet Publishing) with a talk on ‘Metadata – the political dimension’. The launch was chaired by Dr Lyn Robinson, Head of the Department of Library & Information Science and course director for the innovative CityLIS masters programme. The book has already been well received by international academics and leading practitioners. 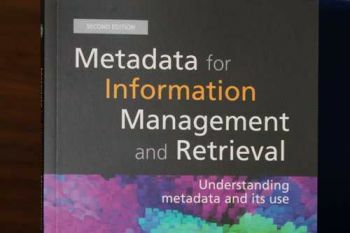 The first part of the book covers the concepts behind metadata and some of the standards that are used for describing information. It then explores the purposes of metadata examining its role in resource identification, information retrieval, managing the information lifecycle, handling intellectual property rights as well as its role in e-commerce and information governance. The final part of the book considers the issues that arise from managing metadata itself. The talk focused on this last area and explored the ethical and political dimensions of metadata. Dr Haynes, whose areas of teaching and research include: metadata, taxonomies, information policy and information regulation, has a particular interest in online privacy. He was awarded a two-year postdoctoral fellowship by the Royal Academy of Engineering in 2017 to carry out research into privacy and risk in the context of public safety. The data and metadata generated by our activity is a powerful marketing and monitoring tool that can enhance and enrich our lives. However, we have to be aware of the harm that can result from misuse and be vigilant about encroachments on privacy and human rights. For more information on the Department of Library & Information Science, please visit this weblink.